. Kukui nut oil is one of the latest ingredients found in many anti-cellulite products. Kukui nut oil is being used with increasing frequency in not only cellulite reducers, but in general products like moisturizers and cosmetics. Kukui nut oil fits many of the requirements for a hot skin care ingredient: it's exotic, it has a cool name, it comes from a faraway place, and it does have many uses in skincare. But does kukui nut oil live up to its buzz? Kukui nuts come from Hawaii, where they grow on the kukui tree. Kukui nuts have been harvested in Hawaii for their oil for centuries. The nuts have an extremely high oil content. A relative of the kukui nut is known as the "candlenut" because it's so oily that you can actually light the tip of the nut and the oil slowly burns, casting a dim yellow light for a couple of hours. Kukui nut oil is collected from expeller-pressed nuts. The oil is light yellow to amber in color. 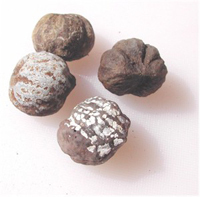 One interesting thing about kukui nut oil is that it will become rancid without the addition of preservatives. The shelf life of unpreserved oil is six to eight months -- then it starts to smell bad. But what does kukui nut oil have to do with cellulite? Kukui nut oil has several properties that make it an excellent skin care ingredient. The oil is readily absorbed by the skin and doesn't leave a greasy film behind. Because of this it is extremely effective at relieving dry skin and is sometimes used to treat psoriasis and eczema. By itself, kukui nut oil is unlikely to have a strong effect on cellulite. It is speculated that kukui nut oil and mango butter have a similar effect, which is a gentle stimulation of the body's own collagen production. But this does not help fight cellulite. Kukui nut oil is best viewed as a base for a skin care preparation, as an effective natural moisturizer, and nothing more. Is kukui nut oil an effective cellulite reducer? No. Kukui nut oil can be combined with other anti-cellulite ingredients to create an effective product. But by itself, kukui nut oil is not going to help get rid of cellulite. It's a great moisturizer and works fast, but it's certainly no miracle cure for cellulite. Don't give up on all cellulite creams. Cellulite creams can help you with specific problem areas. With daily application, they can help you get rid of cellulite. They're a good start to treating cellulite and reclaiming the firm, toned body you remember. Read our reviews of top-rated cellulite creams.